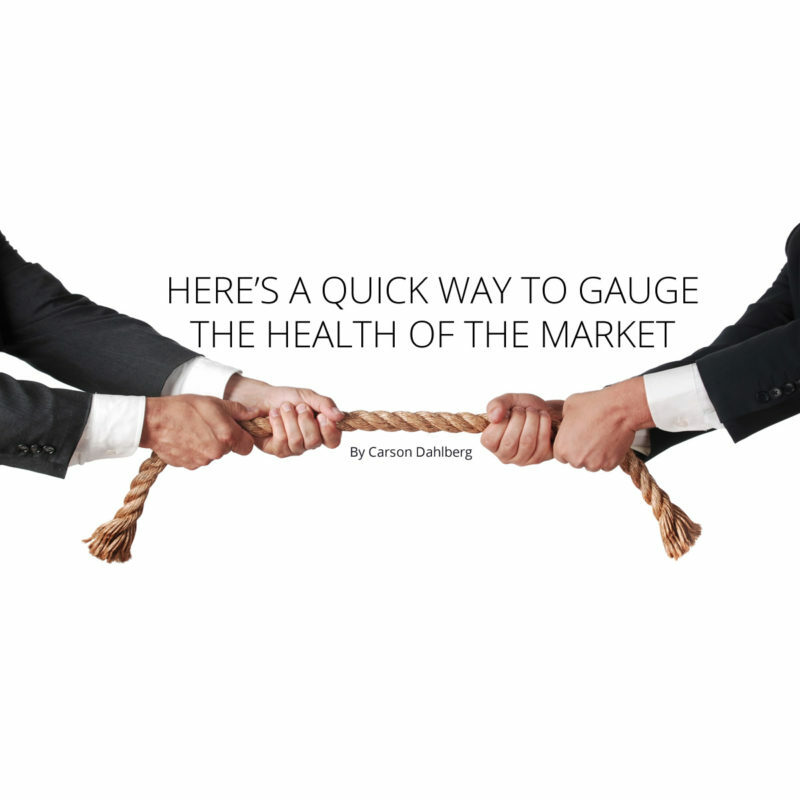 Market breadth is an area of technical analysis concerned with gauging the market’s health. This is done by tracking the balance between buying and selling pressure. It’s like monitoring who’s winning a game of tug of war. Neutral is the “heads up!” warning to watch if the trend resumes or reverses. But a reversal must be proved out. One way to measure breadth is by counting the number of stocks that are above their 200-day moving average (a bullish condition for each of these stocks). Let’s take a look at how we would do this. Let’s say our index has only two stocks, Apple and Adobe. 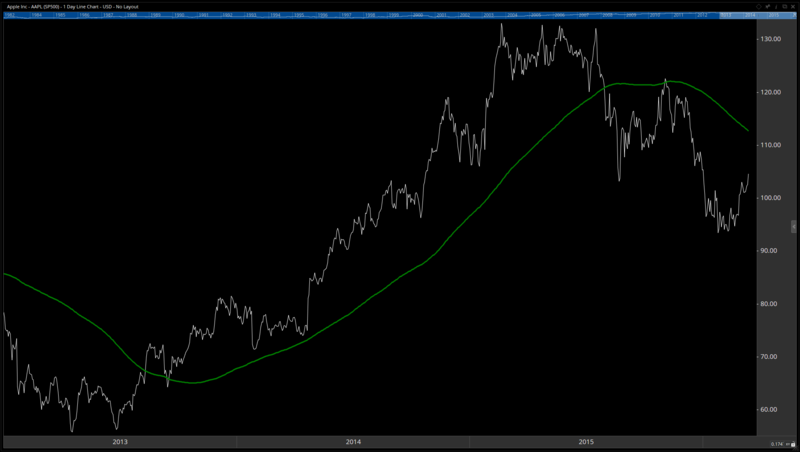 Presently, Apple is not above its 200-day moving average (in green), therefore it would not be counted today. Remember, we count the stocks above the moving average because we only include the bullish stocks. Adobe is above, so it would be counted today. 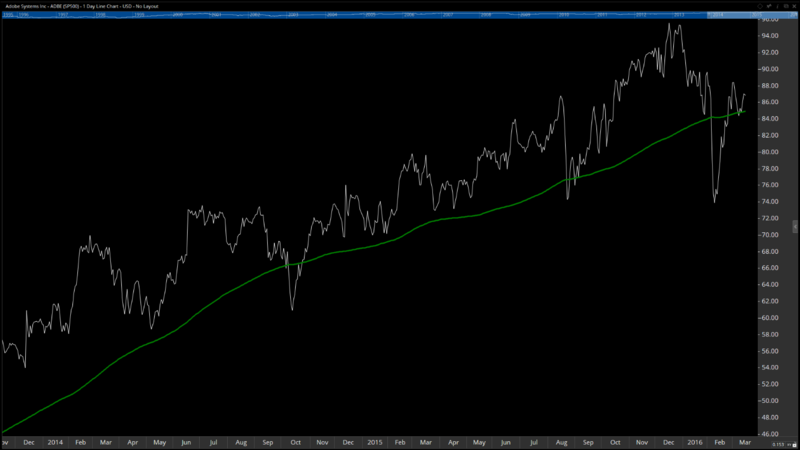 This means 50% of the stocks in our index (Apple and Adobe) are above their 200-day moving average. This could also be done with any other condition you wish to measure. 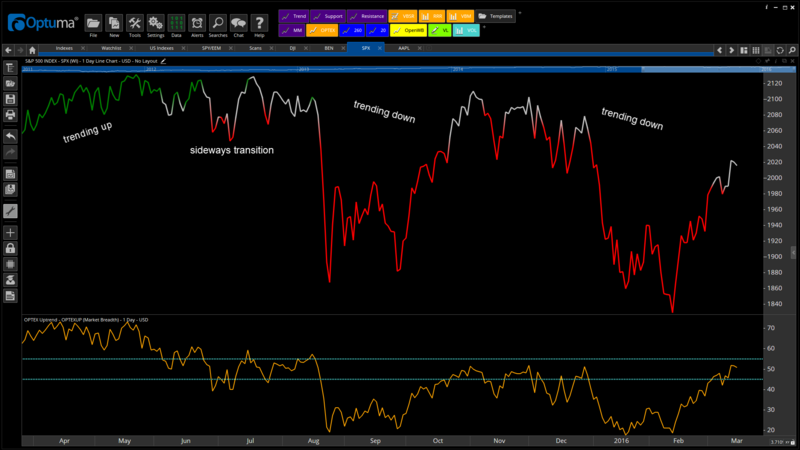 Below is a new breadth chart of the S&P 500 Index, using a new technique created by the team at Market Analyst. This new tool measures if a stock is likely to trend up. Our breadth study will track the percentage of stocks in an uptrend. The breadth indicator – the orange line in the bottom pane – lists the percentage of stocks in an uptrend. 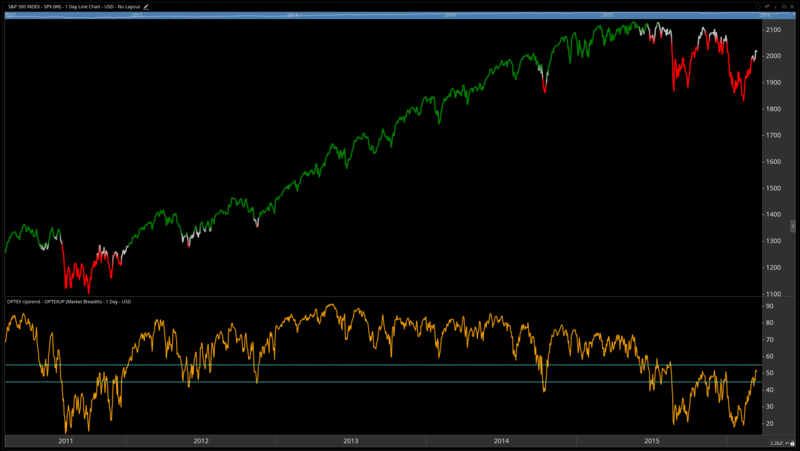 The bars of the S&P 500 Index are colored to help visualize when the breadth indicator is in one of three ranges. These ranges are shown with blue horizontal lines over the breadth indicator. When less than 45% of stocks are trending up, the index is red. Red is the universal color in the markets for down. Between 45-55% is grey, which conotes sideways. Finally, more than 55% of stocks trending up colors the index green. When I see green, I am mostly looking for long opportunities. With red, I am mostly looking for short opportunities. When neutral, I might balance between longs and shorts. My goal is to not fight the market. Remember – “The trend is your friend.” Let’s take a look at what happened over the last year to see how we could have used this. The S&P 500 started solidly in an uptrend evidenced by solid green. The weakening of the uptrend can be seen beginning as the color of the S&P 500 index starts to switch between green and grey in early-June. By mid-August, the color switched to mostly grey and red – warning of a downtrend and potential volatility. Would that have been helpful? Currently, the market is not constructive for the bulls. Continuing between red and grey would lead to the likelihood of more of the same bearish price action and volatility. Green consistently appearing (more than 55% of stocks are back into an uptrend), would signal the bulls are once again taking the lead. 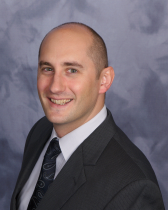 Carson comes to Optuma bringing nearly 20 years of experience in the financial markets involved in technical and quantitative trading, research and education. Carson has worked for several notable firms: Morgan Stanley, Wachovia Securities, Wells Fargo, and Schaeffer’s Investment Research. In addition, he is the co-founder of Northington Dahlberg Research, a quantitative driven, volatility-based research firm, and was the Director of the CMTinstitute (an online program to assist financial professionals in the passing of the CMT examination process). Carson is presently a Director at Large on the Board of the Market Technicians Association and serves the Market Technicians Association (MTA) in various capacities. He was the founder and first Chapter Chair of the Charlotte Chapter for the MTA. His involvement with being the Committee Chair for the Ethics Committee has led to an updated and globally relevant ethics offering for the designation. In the past, he has served on the Admissions Committee, was the Board Liaison for the Journal of Technical Analysis Committee, and was the Director of the CMTinstitute. Carson received a degree in Chemistry from the University of Cincinnati and was awarded the Chartered Market Technician designation in January of 2008.